"On 12 May 1883, the German flag was raised on the coast of South-West Africa, modern Namibia - the beginnings of Germany's African Empire. As colonial forces moved in , their ruthless punitive raids became an open war of extermination. Thousands of the indigenous people were killed or driven out into the desert to die. By 1905, the survivors were interned in concentration camps, and systematically starved and worked to death. Years later, the people and ideas that drove the ethnic cleansing of German South West Africa would influence the formation of the Nazi party. "The Kaiser's Holocaust" uncovers extraordinary links between the two regimes: their ideologies, personnel, even symbols and uniform. The Herero and Nama genocide was deliberately concealed for almost a century. Today, as the graves of the victims are uncovered, its re-emergence challenges the belief that Nazism was an aberration in European history. "The Kaiser's Holocaust" passionately narrates this harrowing story and explores one of the defining episodes of the twentieth century from a new angle. Moving, powerful and unforgettable, it is a story that needs to be told." "In the German genocide against Herero and Nama we read of extermination orders, forced labour and concentration camps designed to kill off indigenous peoples who were articulate, politically able and well resourced, but ultimately doomed as the Kaiser's troops introduce a policy of "absolute terror and cruelty... by shedding rivers of blood and money" (General von Trotha) in which the missionary churches were actively complicit. This alone is a story that needs telling widely, but the second part of the work shows the significance of this colonial experience for future nazism. The colonies first Governor was the father of Hermann Göring, the uniform of the SA was that of the Wilhelm II's brown shirted colonial army. More significantly, the colonial period saw the emergence of the pseudo science of eugenics and the legal framework to protect the purity of German settlers from racial contamination. Terms appear that are to be more infamously used later: Rassenschande (Racial shame), Rassenreinheit (Racial purity). Interracial marriage is made illegal. This was all to make the colony racially safe for emigration for a Volk that needed Lebensraum (living space) to expand into and escape population pressure at home. In the final chapters Olusoga and Erichsen skillfully show how these ideas survive the collapse of 1918 and become a core element of the politics of the right. Hitler uses his Landsberg imprisonment to read much of the work on race that emerged out of the Wilhelmine colonial experience. After 1933 races considered impure, German Jews and Gypsies, are subjected to the treatment first employed in South West Africa: Nuremberg Laws to end racial mixing; control and internment in concentration camps, forced labour, extermination. One chilling story is that of the 400 "Rhineland Bastards", children fathered by French colonial troops occupying the Rhineland after 1918. By 1937 all are sterilised. There is a final twist in the argument. Hitler's war, it is argued, was ultimately one for colonial Lebensraum in the east. The German treatment of the eastern populations and Red Army was different to the western conflict as Hitler considered the eastern peoples to be similar to uncivilised indigenous colonial peoples. Fighting was more brutal, civilians were treated with even less regard. Necessary he believed to ensure Lebensaum and civilisation. The nazis compared this push East to how Wilhelm's troops had fought the Herero, or the British the Sudanese & Tasmanians, the US the Native Indians, or the Argentines with the tribes of the south. Thought provoking, this is an important, thorough and well written work. It ranks with Hochschild's "King Leopold's Ghost" as an indictment of European colonialism but develops its arguments beyond normally considered confines to place the events of a short-lived German colony in a far wider context." You say that Germany is always guilty..
At least there is a Verganganheitsbewältigung. How did you think get the UK so many countries as colonies??? The UK had killed millions of people, in the time of the british empire died under brtitish rule 5.500 Indians every day. That was genoicide. But there is no "sorry" for the victims the british empire is still glorified in the UK. Belgium and Leopold II. had killed millions of people in the Congo and squashed his colony. Marie, I think you should read the last two paragraphs of Ellla's post again. Though Wilhelm was ruling at the time most of this happened, was he personally associated with it in the way Hitler was? Not that I ever knew before this small quote from what is a complete book. I see your point, but then why is the title of the book gving the wrong impression? Marie is simply pointing out the obvious bais that is only unearthed or exposed in anecdotal comments. However, need to read the book to be sure. I don't think the book's title prves anything. The German offensive of March 1918 has become known as the Kaiser's Battle, but Wilhelm certainly did't take command of it. I thought the title was referring to 1883 and the period of concurrent imperialistic policies of leading European nations and the U.S. My mistake, but the except confuses. Bao, Cunningham and Townsend - are they descendants of Kaiser Wilhelm? I am a newbie here as you can probably tell from my profile - I just joined today. 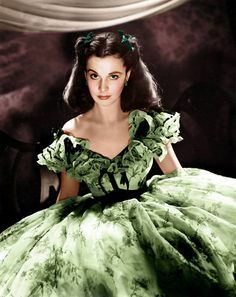 I am an amateur genealogist and have reached a number of brick walls in both my own family tree as well as that of my husbands. So I need a new challenge. My challange is to create one huge big family tree of everyone on the British line of succession. The list I have, has over 1300 names on it. Of course, these names are all protestant. I will be adding in Catholic spouses and families as and when necessary. Running my eyes down the list which I found at the below link - I came across 3 interesting families with the names of Cunningham, Townsend and Bao. Stephanie Bao is listed as a great (x2) granddaughter of Kaiser Wilhelm, and also her father is Prince Stephan von Preussen. I cannot find any information about him at all. Bao also appears to be a Chinese or at least a Southeast Asian name. Does anyone know who the father of Stephanie's kids is? This family is listed around Number 380 on the list. If anyone can let me know how they are related to Kaiser Wilhelm, or at least to the British royal family, that would be great. Re: Bao, Cunningham and Townsend - are they descendants of Kaiser Wilhelm? See http://www.thepeerage.com/p10389.htm#i103889 They are descendants of the Kaiser's fourth son, Prince August Wilhelm. They are both descendants of Luxembourgeois princesses, who may have British succession rights through Anne, Princess Royal, daughter of King George II, Princess of Orange, whose daughter married into the House of Nassau-Weilburg. WOW, Such a fast response. I have seen the Peerage website but I cant seem to get a handle on how to find my way around it. But now that I know what treasures it holds, I will keep trying. 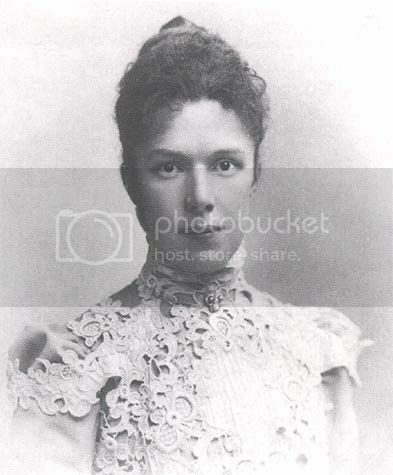 Kitt, your family's experiences were similar to almost all ethnic-German families across the USA after 1914. My grandfather was forced to change his name in order to keep his job. He went from Heinrich Rosengarten to Patrick Rose. The anti-German craze even went to the extent of "biting off the nose to spite the face". The biggest industry in the nation as the 1920s came in was beer production and sales. Ethnic German brands controlled over 80% of the market share. The strong anti-German movement and lobby used their might and the German dominance of the beer industry to build the case for prohibition. It was probably the single greatest reason why prohibition was made into law. Interesting, never thought of that! HerrKaiser) You're misunderstanding what I'm referring to. When I say "track record" I'm comparing Germany's semi-autocracy to England's Constitutional Monarchy and their move toward parliamentary style government, and the French Republic. So Germany's political track record in terms of their government was naturally worse in the eyes of the United States. You can't call the German Empire a semi-autocracy. Remember that there was universal male suffrage on the federal level from the beginning in 1871. (Actually from 1867 in the North German Federation.) Decades before Britain had universal male suffrage. Of course the executive branch (the Kaiser and his government) was not elected, unlike the US President, but just like the US the German Empire did not have a parliamentary system, there was strict separation of powers. Thus it was prone to the same dead-end blocks and conflicts between the executive and legislative branches that we see in the US right now. Spotted in yesterday's 'Daily Telegraph. 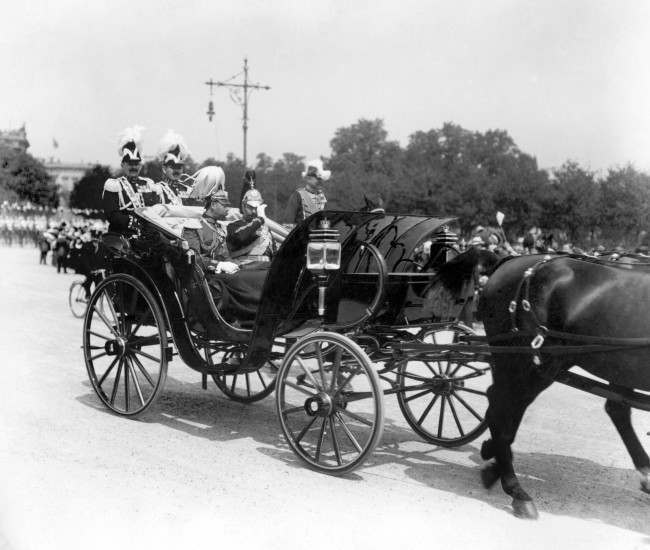 King George V and Kaiser Wilhelm II driving in Berlin. 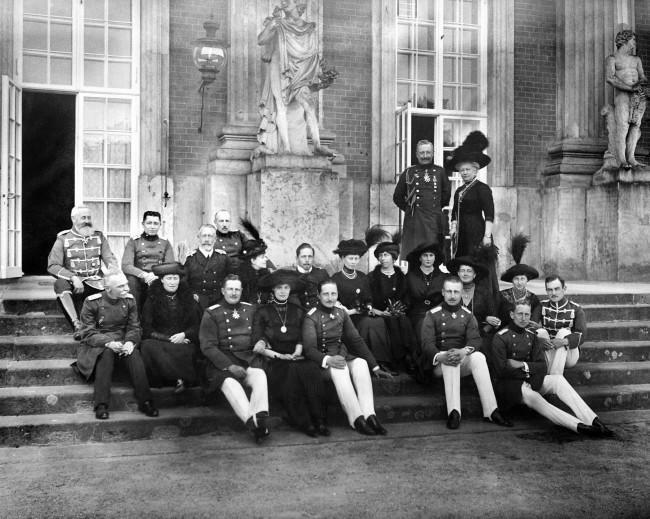 The Kaiser and Kaiserin with, sitting on the end, far right, second row, the Duke and Duchess of Brusnwick amongst other friends and relatives at the Kasiser’s Christmas party. I suspect this wasn't a Christmas gathering, since the men in the front row (including Eitel Friedrich having weight problems) are wearing white trousers - worn by the Prussian Guard in summer. Could this have been taken at the time of the Kaiser's Silver Jubilee in June 1913?